Implementing innovative solutions takes leadership. Innovative solutions require a change in perspective and a change in thinking. Sales leaders champion those changes for the customer within their own organizations. You would think that everyone in the organization would welcome a chance to accommodate customer requirements or new ways of serving them, but there will always be some who resist. They will argue that the organization doesn't do what you are proposing. They will argue that it will cost too much, that it isn't in the budget, and that if they do what you want it will mean they can't do something else. They will suggest that it will not work. They will stand behind protocol. I've observed that in many cases, the most difficult part of the sale or of implementing the sale isn't getting the customer to agree - it is getting the support of people inside your own company to do what needs to be done, or to do it quickly enough that you don't lose your credibility with the customer or your competitive position. Many times it is the classic battle between sales and marketing or product management. In order to get people aligned behind your idea, you will need to take the initiative. You'll need to positively influence your colleagues in your organization to get them to do what you see as needing to be done and do it in a constructive way, not burning bridges. What this means is that rather than forcing support, you work to gain commitment. You can force support, but that will work only so many times before people say no. In essence, you need to "sell" your idea on the inside even more effectively than you sell it on the outside. How do you do this? By being a leader. Peggy Champlin, formerly an engineering manager with a Canadian technology supplier, saw firsthand the challenges of getting engineering and marketing and sales to work together to develop updated or new applications for customers. Engineering is quick to say no. Marketing is eager to say yes. Each had different incentives for their work efforts, and those different incentives could easily cause them to lose sight of whom they were both working for. Marketing saw the sale being at risk and was rewarded for making sales. Engineering had schedule and quality requirements for which they were accountable. With lead times of six to nine months, we had to coordinate all our projects. The salespeople who were the easiest to work with did two things: They respected the constraints we had to work under. And they listened to me - they tried to understand what was possible and what wasn't. I would always try to bend over backward to help them, explaining what we could or could not do. The key was when they were willing to work with me to find ways together to make the customer happy, when they took the technical requirements into account and worked with us to develop the best solution for the customer, given the technology, the schedule, and budgets, and when they did it without an attitude. The leaders knew there were better ways to achieve their goals, to get us working with them. They looked at things from a higher plane. Sales leaders are in the business of influencing others. That includes customers and colleagues (engineers, service, support, or executives) as well. What do people do who are effective at influencing others? Let's understand the concept of influence by taking a look at how leadership has helped you be successful or how someone in a leadership position has influenced you. Two questions follow that will help you understand the way leaders work. Take a moment to read the exercise and think of a situation that fits. Choose one of the two questions. Go back to a defining moment, a time when you were influenced to follow someone else's lead in a sales initiative that resulted in an innovative approach for solving a customer problem. What insights do you have about sales leaders based on your own examples? What were the leadership qualities that allowed you to be successful? When we think about people who have influenced us as leaders or times when we have used our leadership abilities, we associate those times with positive emotions. They are memorable for us and sometimes they positively change the course of our companies, our careers, our lives, or the lives of others. We may not have a lot of these experiences. We would be fortunate if we did. But the times we experience leadership do stand out. We ask people, "Do you know someone who you consider to be a sales leader? If so, what qualities would you say contribute to that person being a sales leader?" I started with my own list and then received a number of additions. I began with some important qualities: integrity/honesty, competency, enthusiasm, vision, energy, empathy, and communication skills. I received suggestions to add the following qualities: motivational and passionate, committed, and servant attitude. Determining which leadership qualities you possess can give you insights about where your strengths are and where you could improve. Every sales leader will not possess every quality. But each will use those that are necessary and will compensate for those that are weaker. I have a ten-point sales assessment that I use to help individuals and organizations determine their strengths and areas for improvement. Sales leaders tend to like this type of feedback because it helps them understand themselves better and more objectively. One of the pitfalls that can happen when you propose innovative solutions is making bad decisions. Avoid framing the problem and the decision in the wrong way from the outset. Most people don't pay attention to the emotions at play behind the decisions they make, but they can certainly be influential. These emotions can be as simple as what we like or dislike or what we are predisposed to be for or against. Making better decisions depends on developing better decision-making processes. In a technologically driven company that bid on large contracts, I was asked to examine a competitive situation where this company had lost out on a multimillion-dollar contract. I interviewed key people involved and facilitated a discussion of the case. The case study laid out three phases of the bidding process: the decision to bid, the bid preparation, and the debriefing after the bid was rejected. I identified several key findings. In particular, it became apparent that the team that was responsible for putting the bid together had locked into a particular approach early on. This approach involved the technology they were planning to propose, the risk they were willing to accept in determining profit or loss should they win the project, and the other companies they were partnering with. As the bid developed, it was difficult to adjust the approach they had taken and the assumptions they had made. One of the key findings was that instead of locking into a fixed set of assumptions when developing a competitive bid, this organization (and any others in similar situations) should have used a process called scenario planning. Scenario planning was first developed by Royal Dutch Shell in the 1970s as a way of trying to decide on major future investments in oil exploration and development. They realized that they couldn't predict the future, and that any single prediction of the future or the assumptions that it was based on could quickly become obsolete and undermine their decision. Shell decided they needed to examine a range of options. They wanted to provide flexibility to adjust their actions depending on how the world energy and petroleum situations developed. At the time, they weren't sure whether there was going to be an excess of capacity or a shortage. As it turned out, there was a shortage to the extent that the U.S. had gas rationing for a time. By not locking into one prediction of the future, they were able to adjust their approach to take advantage of the evolving situation. Innovative, large sales involve longer time frames. These longer time frames make it more difficult to predict what will happen within the industry, the client organization, or the financial situation. Having several possible options under consideration makes it easier to change direction and prevail over competitors who have locked themselves into an inflexible course of action. When we make assumptions that turn out not to be true, we can suffer negative consequences. A typical sales example is, "The customer has the budget for what I am proposing" or "I am working with the decision maker." If, in the excitement of going after a sale, you haven't asked the right questions up front (such as assessing budget requirements or the decision process), you may waste a tremendous amount of time. It's better for you to know from the start what you are working with than to find out when you present your recommendation to the customer that your proposal is dead in the water because of existing circumstances that you weren't aware of. We make assumptions all the time, often based on our experiences. History is replete with examples of outmoded assumptions: the world is flat, no one will break the four-minute mile. To achieve breakthroughs, identify and challenge your own assumptions. Write them down and test them. Don't leave them to chance. At the very least, identifying and clarifying your assumptions with others will minimize the risk that you and the other person are making different assumptions.
" Many of us were taught that the cancer cell was so messed up with so many biochemical abnormalities that it was impossible to correct them all and therefore really impossible to kill the cancer cell with medicines that hit specific targets in the cancer cell. The fact is that we know that's not true. We know that we can get very good responses and perhaps even cures with very specific targeted molecules. Imagine what we can do when we start combining them and hitting two or three targets at the same time." Here is an example of how having a plan B can make a difference. There was a machine that played a critical part in making the chip used in cell phones made by two cell phone manufacturers. The machine was severely damaged by an electrical surge during a lightning storm. The team from the company with a plan B went into action, contacting alternative suppliers who were able to ramp up relatively quickly and begin replacing the production that was lost from the primary facility. While these alternative vendors did not supply as many of the chips as the primary facility did, they knew the specifications and the process and could start relatively quickly. The other company did not have alternative suppliers. They had to begin to look for them. This was a much more time-consuming process because it meant not only finding the suppliers, but evaluating their capabilities and then negotiating contracts and other arrangements. It was reported that this company lost hundreds of millions worth of sales as a result of this incident when they were not able to produce phones, all because of one critical machine being damaged. Who do you suppose was the primary beneficiary of these lost sales? Now imagine if you were the salesperson who could have sold this account on having a backup. One of the most critical contributors to your success is the quality of your decisions. Poorly made decisions derail people and projects. Making decisions is part of a leader's life. Every leader has to make tough decisions. Tough decisions affect people, involve great uncertainty, or have the potential for significant consequences, both positive and negative. Knowing how and when to make tough decisions is a hallmark of decisive leaders. Knowing what decisions to make is the trademark of a leader who thinks in long-term outcomes. Make a tough decision prematurely, without considering the facts or the effects, or make it based solely on an emotional overreaction, and it can be a disaster. Put off the decision, procrastinate because of fear, and it can mean missed opportunities or bigger problems. Understanding when to seek counsel and when to move ahead in a business environment that doesn't wait for the perfect solution can be the difference between success and second place. Tough decisions might involve deciding when to go after a sale and how aggressively. Tough decisions could involve deciding how to handle someone who is not fulfilling his or her role on your team. Tough decisions may involve deciding when to stop providing products or services to a customer. Sales leaders don't shy away from the challenges these tough decisions present. These are the kind of decisions they are suited to handling. Walking away from a sale is never easy, but if the sale sounds too good to be true it probably is. I had the opportunity to speak with Ken Wheatley, vice president for corporate security for a well-known consumer electronics manufacturer, the president of his own security firm, and a former FBI agent. He related an incident in which a number of well-intentioned salespeople and their companies were duped out of $100 million. The salespeople involved were led to believe they were going to be able to make a large sale, so they got excited about the possibility - probably too excited. They were told to contact only a certain person, they were given an address in a European country that was supposed to be the company's headquarters but turned out to be a storefront, and they were asked to send samples of products for test evaluation (worth millions - of course, the products were never returned). There were clues that something was amiss, but in the excitement of the promise of large sales, salespeople and others overlooked the clues. It was costly. Another element of greediness that can slip into the sales process is eagerness to offer financing to win the deal. If the buyer's finances are strong, you won't be risking your company by offering terms. But if the situation deteriorates, your company may be left holding the bag; what seemed like a lucrative sale may turn into an albatross. If highly attractive financing is the only reason that the customer is interested in buying, that's a red flag. The sale should stand on its own merits, and financing should be an option for closing it. Otherwise, the real cost of the sale could exceed what the customer is going to pay. Your commission may be based only on the revenue from the sale, but your job may hinge on whether the customer pays. Think carefully about the questions you or someone else will need to answer to make an informed decision. Write those questions down. They will be the start of a plan to help you make a timely, quality decision. Do the research you need to do to answer the questions. Develop supporting data. The more significant the decision, the more carefully you will need to research. If the decision is irreversible, it clearly requires more consideration. If the decision is reversible but would be costly to reverse, give it more consideration. If the decision has the possibility of high impact (on members, employees, revenues, and so on), give it more consideration. Start with internal resources. Use historical data, forecasts, and colleague review. Use outside resources as needed: the Internet, a library, and a local college can help you find facts, data, stories, and examples. Get information that supports a rational decision while paying attention to the intuitive sense you have about the decision. That intuitive sense will be based on your experience. Your emotions will certainly influence you. Be sure to understand the extent to which they do. Don't overreact based on past experience. Gather information methodically but quickly. Develop a plan for gathering the information. Are you the sole person responsible for making the decision? Will you need to present the information to someone else or to a committee? Will the decision be made by consensus? The more knowledgeable you are, the more confidence you will have in the decision you make. Be open to new options, rather than automatically staying with the status quo. Don't put off making the decision once you have sufficient information. Take a calculated risk. There is no perfect decision.
" Being comfortable with 80 percent of the information and making the decision on time is better than having 100 percent of the information and making the decision late." As soon as you have agreed to do something for someone, that person believes you will do it. You need to demonstrate that you are doing your best to meet that expectation. Not letting him or her down becomes a matter of integrity. When you have a strong sales team in place, getting everyone on the same page becomes paramount. Most salespeople and their managers are well versed in the goal-setting process, so the following ideas may be a way to refine what you do, especially when you are involved with a more complex project or something out of the ordinary. I did some work with a group that specialized in software for a certain industry. Their goal was to deliver bug-free software to their customers. When I asked how they defined a bug, they spent at least fifteen minutes debating it. Some people argued that it was a malfunction in the programming, which is what I think most people would say is a bug. Some said the malfunction could be due to a misinterpretation of the client's requirements. Others said it could mean that the documentation for the software was incorrect, misleading, or difficult to follow. What the customers wanted was software that worked right the first time and every time. They probably also wanted it to be easy to use and consistent. So if you widen the scope of the idea of a "bug," you could see how it might look from the customer's point of view. Regardless of what anyone said, it was clear that there was no commonly agreed-to definition of what a bug was - and if they weren't sure what a bug was, how could they be sure that they were delivering bug-free software? What seemed self-evident to everyone became uncertain as the discussion progressed. That was actually good because it gave them a chance to reexamine this goal to make sure they knew what it really meant, not just to them but also to their customers. All too often, the problem with goals is that people think they know what they are supposed to achieve, but their objectives are not specific enough. When asked to describe what result they really are expected to achieve, it becomes apparent that it is ambiguous. I use an example in some of my workshops where I offer to paint the inside of someone's home. Usually, someone will accept my offer. The person will be interested until I describe how I will paint the interior of their home. They almost always say, "No thanks." What started out to be a simple goal, painting the inside of their home, turns out to be something very different from what they envisioned. The problem is that the goal wasn't specific enough to begin with. There are two ways to measure success in reaching goals: objectively or subjectively. When you set sales goals, you typically set them based on objective measurements: number of units or revenue, for example. You may also look at objectives for retaining customers or obtaining new customers or certain types of new customers. Counting the number of units tallies objective measurements. Subjective measurements are a matter of opinion. One of the most important subjective measurements for salespeople is customer satisfaction. Whether the customers are happy about the service they are getting is a matter of individual perception - completely subjective. We run into subjective measurements every day. Someone will say, "On a scale from one to ten, where ten is greatest or best, where would you say you are right now?" Or customers are asked to indicate whether they are highly satisfied, satisfied, neither satisfied nor dissatisfied, dissatisfied, or highly dissatisfied. Some people prefer to deal in hard numbers, but keep in mind that important decisions that customers make are based on their subjective opinions. They like something or they don't like it. Understanding their opinions becomes crucial to providing the solutions they want in the way they want them and retaining them as customers. To have a balanced picture of your success, look at both objective and subjective measurements of success. I have a quick exercise I ask people to do in my workshops when we talk about setting objectives. The exercise involves stretching beyond where they thought they could stretch. In asking tens of thousands of people to do this exercise, I have rarely found someone who couldn't do a bit more than what they thought they could do. The point with the exercise is that we sometimes place constraints on ourselves that aren't there and that when we think creatively about what we have to do we can find ways to accomplish ten times as much. When we work with others together as a team, there is just about nothing that we can't accomplish given the resources. If you find yourself too often in a crisis mode trying to meet deadlines, the following discussion is one of the most useful ways of getting out of that way of working. There are three types of time frames inherent in meeting deadlines. The first type is the most common: the deadline, when the objective or project is scheduled to be met or completed. The second type of time frame is the milestones, the intermediate dates that must be met if the deadline is going to be met. The third type of time frame is the start date. The problem with focusing on the due date is that it is far into the future. Today, if I am fighting the crisis of the day, I say to myself, "I know that project is due, but it's not due until next month. I'll start it tomorrow." Of course, when tomorrow rolls around, what happens? I have another crisis. When do I actually start that project? When it's due, because now it's a crisis. What should you do instead? Focus on the start date, when the project or task must be started if it is going to be finished on time. What does that change in focus do? It gives the start date a sense of urgency that helps it compete with the crises and interruptions. They are urgent, but will not necessarily contribute value. It's beneficial to focus on the start date and milestones. When someone starts to distract you away from the project you are working on, you can explain that you have a deadline to meet, and it's true. You know that if you don't meet the immediate deadline you won't meet the final one. People will usually accept this explanation. This helps you control interruptions and get work done on time. Quantity answers the question "How much?" or "How many?" This is typically the easiest part to specify. Quality answers the question "How well?" This is often the most difficult part to specify, but it is the most important because it usually makes the biggest impression on the customer, who defines quality. You don't want to be surprised. If you are ever given a choice about delivering a result on time but of questionable quality versus delivering something late of unquestionable quality, opt for delivering the quality product that meets expectations. Earl Nightingale said that people remember the quality of what we deliver long after they've forgotten when we delivered it. Without a doubt, it's best to meet a schedule, but if you can't meet a schedule, keep the customer informed. The most difficult part of specifying a goal is describing what you want when the job is done. I was working on a project one time and got to a point where I needed direction from the person who had asked me to do the project, something more specific about what he was looking for. I said, "I'm not sure what you're looking for." He said, "I'm not sure either, but I'll know it when I see it." That meant I was going to have to waste a lot of time spinning my wheels to come up with a variety of approaches until he saw one he liked. Time specifies when the objective must be met. Again, time is usually not a major issue, except as it relates to procrastination. Some people are reluctant to plan because circumstances can change so quickly, potentially making well-laid plans obsolete. The problem is that you don't have the time not to plan. You don't have the luxury of wasting time, and that is what you end up doing if you don't plan. A sales professional who goes into a customer meeting without careful planning is going to waste time and opportunity. The sales professional needs at least a clear objective and an agenda for the meeting. He or she also needs to do homework to find out as much as possible ahead of time about the customer, the company, and its preferred ways of working. The sales professional also needs to be prepared to ask or answer questions or to make a convincing presentation. For example, planning could include doing something as straightforward as making a sales call on the telephone. Do you have an objective for the call? How long do you expect the call to take? How will you proceed with the call? Make sure it is as short as possible while covering everything you need to cover. Once you hang up, if you've forgotten an important point you wanted to cover, you know how difficult it can be to get the person back on the phone again or how time consuming voice mail is. One sales manager complained to me about some salespeople who worked for him and didn't plan the rambling messages they left for him. He said he once thought a message was over and started to hang up when he heard, "Oh, by the way . . ." but it was too late. The manager had already hung up. He would have preferred the salespeople to start the call by saying, "I have three things I need to cover," and then go through them quickly. Many of the salespeople comment after they complete one of my workshops that they realize the importance of planning. It's easy to understand. Salespeople tend to be action oriented, to want to get started and get things done. So when I do a workshop that shows the benefits of planning, from the perspective of being better able to quickly win customers' trust and identify their concerns, they see the payoff in precall planning and other planning activities. When I have worked with people on developing plans, most of the time they think of their experience with corporate plans - long, involved, and not used. A plan can be as uncomplicated as you would like and can be done on a page. When Jack Welch was an up-and-coming CEO at GE, he said he resented the long plans he had been asked to put together because he didn't think they had value. When he became CEO, he changed the way the divisional plans were presented so that the key elements could be shown on a single page. The easiest way to think of planning is to think of it as answering the question "How?" Goals and objectives answer the question "What?" What is it you want to achieve? Purpose answers the question "Why?" Why are we doing this? Why are we in business? Why are we having this meeting? Of these three questions, "Why?" is the most important. People want to understand why they are doing something. If they are only told what to do, they feel there is something missing. When people are not told why they are doing something, they can feel as if they are there to do and not to think. If people have a good enough reason, a compelling "why" to do something, they will figure out the how. Planning addresses the how. How will we achieve our goals? How will we complete this project on time and with the quality that it is supposed to have? How will we know that we have been successful? Planning is filling in the steps between where you are and where you want to go. It breaks down the process into a series of steps. In project management we call this a work breakdown structure. You might have heard or worked with GANTT charts. GANTT charts show the steps in a project and the timelines for meeting each of them. They are a much easier way to present a schedule than the standard list of tasks and dates. 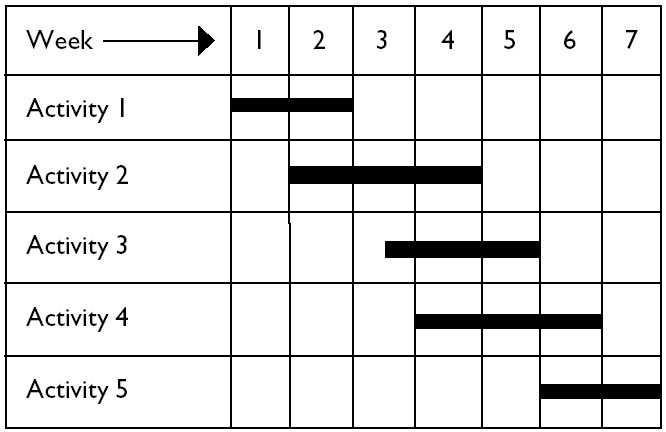 A sample GANTT chart is shown in figure 8. One of the key things I've learned from working on projects is that not only do you have to back up from the implementation or completion date if you're going to meet customer deadlines, you must communicate with customers about how important it is for them to make timely decisions if you're going to be able to meet their time requirements. I worked with a client on a customized program for a national sales meeting. The program was scheduled over four months from the time when we first spoke, but by the time they evaluated the proposal, made a decision to go ahead, signed the agreement, and sent the deposit, there was barely a month left for development. We were still able to develop the program content as agreed, but it was too close. The realization from working with this client was the need in general to inform clients about the timeline and dependencies for meeting their requirements. They probably felt they had plenty of time in which to make a decision, and I didn't think at first that it was going to take so long for them to make it. In the future, on a longer-lead project such as this one I will communicate with the client about what needs to be done by when so they have a clear sense of what we need to do to move ahead and meet their requirements in a quality way. A simple timeline that shows key decision points, starting from the implementation date and working back, is a good way to communicate this. It can be a GANTT chart for more complex projects, or just a single timeline for less involved ones. Either will work. Some of the main elements that a plan should include are shown in the planning template on the next page. Unclear goals: You can't do what you can't describe. Too many goals at one time: This makes it difficult to concentrate on one long enough to get it done. A lack of priorities: Time is wasted on less important goals first. Conflicting goals: Working on one goal creates problems for another (for example, quantity versus quality). A lack of resources: You don't have enough time, money, people, equipment, or training. A lack of specific action plans: This is design without implementation. A lack of belief in the goal or the ability to achieve it: Failure becomes a self-fulfilling prophecy. A lack of focus: This can cause jumping from one goal to another. A lack of follow-through: Some people start well but give up too soon. Missing accountability: No consequences exist when people do not follow through. Are any of these obstacles getting in your way? If so, which are most troublesome? Remember to keep your written goals visible. Out of sight, out of mind. If you are going to set your sights, why not set them high? If you get what you set your sights on, why not get what you want? If you set them high and don't get what you want, you may be disappointed. But better to be disappointed than to miss an opportunity that you may never have again. Follow the lead of the people who are leaders higher in the organization and who model the type of behavior you would like to develop - the type of behavior that gets things done through effective communication and relationships. Watch what they get involved with and how they achieve their goals. Emulate their way of working and then adapt it so that it works best for you. What is your plan for taking your business, your sales, your products or services, and your knowledge and skills to the next level? What is the next level for you? This is a question every sales leader must answer. Growth takes planning. Sustainable growth takes planning for several steps. If you tend not to move ahead to do something because you aren't sure what to do, it's easy to procrastinate. Instead, remove the mystery. Learn what you need to learn or do what you need to do so that the mystery is gone. When scientists set out to find a cure for a disease, they don't know exactly what they have to do, so they may try many approaches in order to learn what works and what doesn't. As they narrow their search, they learn in depth about a particular strategy. Answers become clear only through action. When you don't know something, it has an element of mystery about it. If you remove the mystery, your knowledge increases, and with that your confidence. When your confidence increases you will be more likely to move ahead. When you move ahead, you gain invaluable experience, further increasing your knowledge and mastery, further increasing your confidence. When you master a subject or a skill, you know it extremely well. Become a master of your craft.
" If you want to accomplish twice as much as your competition, you must work twice as hard." - Wayne Huizenga, chairman of Republic Industries, Inc., former chairman of Blockbuster Entertainment, and cofounder of Waste Management Inc. Sales leaders lead their proposed customer solution, supported by sound decisions, through their own organization.